Not even half way through the touring of last year’s Goldenweek/Ironbutt adventure the plan for this year was in the concept stage. Somehow we had to plan a way of doing 2000+km in 24hrs. Having done the 1600k just a few days before, without any major dramas, we were full of ignorant optimism that it was just 400km more. And so the planning or should I say dreaming began to sprout. A few days after returning, James had relocated to the opposite side of the world. Less than a month later, I was out with a crash and knee reconstruction. A few months later and Mic was out with a crash/shoulder surgery. Shortly after that Ide was taken down by a reluctant organ. That only left Tony healthy and able to ride. So the Obon plan, Tokyo to north-Hokkaido was shelved and things delayed till the next year. Come February, I got fired up and set out the basic plan. 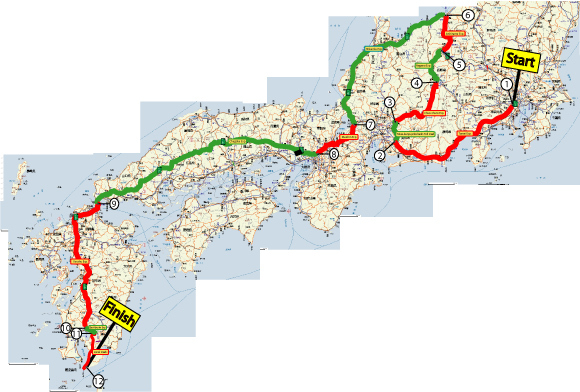 A long route to Kagoshima first heading north out of the east end of Tokyo then west from Fukushima to Nigatta, down the coast a little Up into the mountains and back down again before running west then south for Osaka. After Osaka we were to follow the same route as last year only with a change in the end destination after exiting the expressway. To be honest there wasn’t much interest. For one reason or another all the previous year’s ironbutts were out. Ide couldn’t get doctors clearance, Mic had family in town, Tony was concentrating on the track and James was still entombed in Florida. On the plus side a couple of hard nuts were itching to ride. Anthony, aka Fastbike, a newby to IBA but an oldy to long distance craziness. Try Saitama to Nagano on a monkeybike. He could fix almost any bike or people related problem, talk his way into amd out of even bigger problems and all with a wry smile. Then there was one of the Shuto 1000 lunatics Colin, aka the Dude. After his 1600k on the Shuto he’d been very quiet, the asylum may not have had an internet connection… He dusted off the FJR and showed that consistency and prep is key. As the weeks passed a few piped up and drifted by as is expected and it seemed that there were only to be 3 of us. I was cool with that and so were the others but Anthony had me worried. He was planning to ride his tooth rattling KTM640 motard the distance. I knew he was tough as nails and loved the bike but I didn’t know if his joints or the vulnerable single was up to sustained highway speeds for such a period. To his credit, he stood by his guns until 4 days before the ride(Wednesday) when he wisely bought a CB1300 Boldor from Auction. Now that is an Ironbutt tourer and a great match for him. 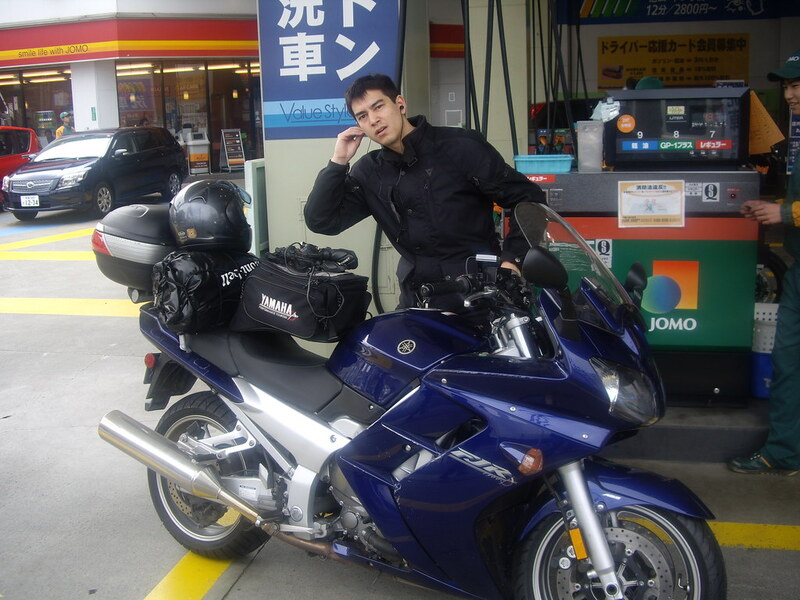 Unfortunately, being so close to departure he didn’t have much prep time with the CB and decided to do a test ride around the Shuto a few times the morning of the Goldenbutt ride. Nut! As if 2100km+ in a day wasn’t enough. Later the same night as the CB buy, Another rider chimed in. Late arrival? Yes, but this happened last year with Tony, aka Midnightrun, and JamesK. Oyvind, aka Oyly. An out of nowhere entrant, on an R1 no less, with Norwegian distance riding experience. His name is now quite fitting. That automatic chain oiler contraption sure kept his chain lubed as well as his swing arm and possibly anyone following him. Gotta say I was getting the same feeling as Fastbike with the KTM but put faith in him for his conviction. He was going and that’s all there was to it! Then at the last minute a route change was decided for start point convenience and economic reasons. We decided on the course below. A snaky route that was showing 2250km. All, except the last run to the goal, expressway. All the calculations were made, fuel stops noted and printed out and clear directions given. Unfortunately the numbers on the sheets were for true kilometres, not our bikes varying odometers. This would become a nuisance and motivation drainer later on. All seemed set for a smooth start from the Kanpachi/ Tomei intersection Starbucks on April 27th at 12 noon. Everybody had different ideas on long and short term prep. 9hrs sleep the night before with a 9am wakeup and 11am departure was in the cards for me. So I ended up working late Saturday night and nodding off at midnight. Good start. Then waking up at Seven and drifting in and out of slumber with the need for sleep and anticipation competing for consciousness. Finally climbed out of bed at 9, on schedule, and feasted on a good fruit and pancake breakfast. Good riding fuel – tasty too. Loaded up all the gear and set off down route 1 at 10:50am. Got to the Daisan Keihin entrance and had a dark revelation-witness forms are where? Turn around, burn rubber, pick-up forms and schedules for everyone then high tail it off to start point. Turned out to be only 5 minutes late anyway. All were present and rearing to go. A few observers came to see us off, thanks folks! We filled in forms, checked each others bikes over, met Oyly, discussed a little fuel schedule strategy and felt pretty prepared. Well I did anyway. Seemed Colin had figured out his own fuel stop schedule for the oil tanker FJR, 2 fuel stops for everyone else’s 3. Oyvind stuck with me as we thought our bikes should have about the same range, turned out the standard R1 was more frugal than the modded FZ1! That left Fastbike who’d already clocked up 100 and sumthin kilometres on the Shuto trying to figure out his new ride. He decided to stick with Oyvind and I in case his tank couldn’t match Collins. Turned out it probably would’ve gone even further than the FJR. 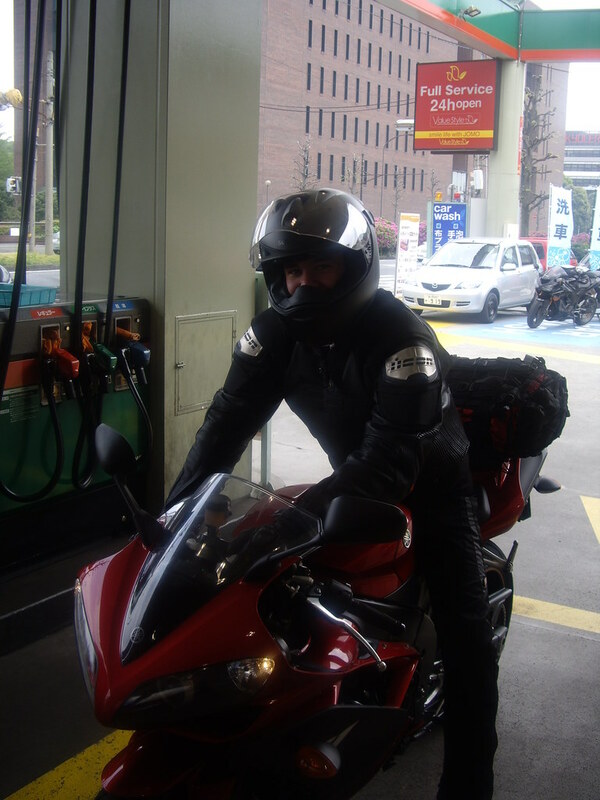 The clock struck twelve the helmets were donned, engines started and the contenders motored around to the gas stand next door for the official fill up and 1st receipt. Photos taken, spectators farewelled and the four headed for the Tomei entrance. Hittng the entrance ramp the revs rose and butterflies faded. It was riding time! 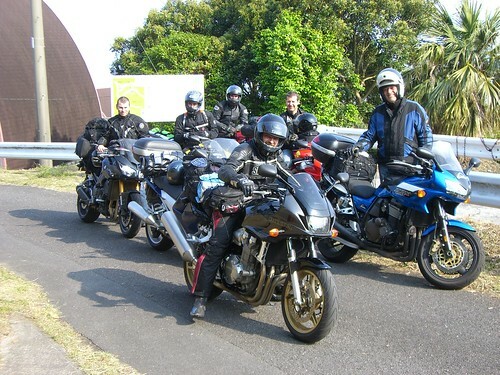 We pretty much rode as a unit to Makinohara, my 1st assigned fuel stop at 205km. Colin kept on rolling with a gloating wave. “Damn old fart tourers” I thought. He wouldn’t stop for another 100kms or so. Anthony and Oyvind pulled in also and we had a short pow wow, ballast drain and then a chunky little guy with more rings than Mr T began crouching and festering around the rear of the Yamahas. Bit dodgy, what’s his caper? Gave him the polite good day and asked what was up before he had a chance to punch one of his shiny/pointy rings in any tyres. Turns out he was a Yamaha worker responsible for swing arm line production work. Ah, no problem. But wait a minute, why was he looking so closely? Did he know something we should… but he’d scuttled away before we could interrogate him. Fuelled up and hit the road again. Next stop Enakyou on the Chuo, 186kms away. Getting there we took a slight short cut across the Isewangan extension between the Tomei and Chuo. Very little traffic, smooth open road with lots of long tunnels. Oyvind and I motored on and Anthony dropped back a little only to catch up and scoot out of Enakyou before us. He was showing promise. 176kms later had us rolling into Obasute. Mountain country and the sun was fading. With the cold starting to settle and our first scheduled meal, we mossied on inside for a feed. A hot noodle set and some sort of hot seafood pocket thing were shovelled in to feed the furnace. Again Anthony was out and away early. Oyvind and I decided to switch to cold weather gear. That took an extra 15minutes we didn’t have but kept us warmer. Actually I was in toasty heaven thanks to the heated powerlet jacket liner and gloves. Had fun playing around with the temperature controls to match the elevation and associated temperatures. Also good for matching windchill to varying speeds. I rode for a long time without this luxury but now…. Back on the road with fading light, around 6pm and @570km in, we were headed for the sea of Japan coast and the next fuel stop, Arisoumi. I remembered this road as an early morning slab run infested with plague proportion bugs from last year. Well, I’d forgotten about the tunnels and was relieved to see the bugs were not nocturnal. Less than 2 hours and 200km later we rolled in to feed the steeds. A splash and go had us clutching up to highway pace again in no time and Anthony was still out there ahead of us somewhere. Well we found him confounded by the signage that had caught me out last year. The turn off for the ### Hokuriku expressway. We knew we should be barrelling down the Hokuriku Expressway, but which one? It caught Anthony out this year as it did me last year. A toot of the horn, flash of the hazard lights and highbeams and I could see him drifting out of the emergency lane into our wake on the road west. Lucky he didn’t head south. We’d gone about 50metres up that exit before shuffling back last year. By the time we pulled into Nanjyou I’d contracted the highway fever that the Hokuriko seems to inflict with it’s monotonous lazy snake of a road. I think I could ride that highway only leaning and never having to turn the bars. On the plus side it seems the bugs were in short supply at night around there too. Relief. Anthony pulled in as Oyvind and I were rolling out and we agreed to catch up for dinner at Nishinomiya, west of Osaka. Now things hit the 1st snag for us, Oyvind and I that is. The local spaghetti junction through Osaka is a relatively easy thing but it only takes one wrong turn and disaster. Oyvind was leading and the traffic was thick down the Meishin. I mean steady 80km/h can’t shuffle traffic. Sitting several cars back from Oyvind I saw the sign for the Chugoku Expressway(our next route line) but he wasn’t moving over. I knew this was all new to him and the traffic may have been disorientating, so I tried to catch up to him. No chance! Sunday night Meishin drivers are a painful bunch. Not a hair space was given. I managed to pull over toward the exit lane hoping Oyvind was looking in his mirrors and would follow my cue. I saw him craning his neck about looking for me but I was lost in the masses to him. I pulled up on the divide and thought, leave him or chase him down? Only one thing came from leaving him and that was losing him off the end of the Hanshin. So? Go get him tiger. Had to get a little creative a few times, the traffic thinned as exits passed and eventually I caught up to him. He seemed glad I was back and oblivious to the fact we had missed our exit. Fair enough he wasn’t the route planner of the 2 of us. Then my reserve started flashing and toll gate signs came up. This is gonna cost us some time, yennies and kilometres. Exited made a loop, re-entered and headed back looking for a Chugoku link or gas station. Gas station came up 1st. Friendly guys there with bad news. Had to exit the expressway to get across to the Chugoku. Seems there is only a direct link running east west Meishin to Chugoku and not west east Hanshin to Chugoku or something like that. Well, no help for it. Fueled up and headed out to traverse this confusing foreign wasteland of white lines, symbolic signs and herded sheep drivers. Sometime later and almost 1200kilometres in, we rolled into Nishinomiya as Anthony was kitting up to roll out. I got off my bike, Anthony asked what had happened and I dummy punched Oyvind in the guts a few times to relieve some stress. I think Anthony got the message and said something like: Gotta love the size of the sign for the Chugoku exit! I almost missed it. Well we had wasted our evening meal time with the detour and change to warmer gear but sustenance is essential in this kind of enduro challenge. So we ate short, fast and warm food and topped off the tank before hitting the black top for my most anticipated leg of the route. The Chugoku expressway. About 600km of near deserted, clearly marked, constantly winding, elevation changing highway heaven. To do it at night may sound a bit dicey but throw in the corner markers, I mean EVERY corner less than 550 metre, showing the corner radius and you really get a seek and conquer ride rhythm going. I remember putting the throttle lock/cruise control on, relaxing the arms and guiding the bike by knee and pegs for a good ½ hour. Just changing lean angle to account for corner radius. Felt more like a training exercise than a tiring stretch of meaningless black top. The stretch to Oosa is quite timid with most corners in the 4-550 metre range with a mostly climbing elevation. The HID headlights were working a treat on high-beam when banked over and Oyvind was right there flanking me. After pulling out of Oosa I knew the course would be tightening and the corners seem to slowly decrease down to 320-400metre radius. Now it was getting interesting. Throw in the odd mid corner elevated bridge slab and there was no way I would be drifting off. The elevation changes were constant, the traffic nonexistent and the bike was running smooth. But damn it was getting cold. Or so the unheated were telling me. Hehehe! Making regular lead changes with Oyvind we made a bee line for Asa, our 8th fuel stop and a short 130km from the last. A necessary stop to get in sync with the west end fuel stops. Pulling in to Asa we saw something we hadn’t seen since Makinohara, the big blue FJR. We’d finally caught up to the oil tanker. Seems mister consistent was just on his way out. Frozen but thawed, tired and without much reluctance he stayed for a chat and warm cup of coffee or was it noodles? Blah! Who cares? In the warm road station we swapped road tales for a bit. Then a blue lipped, hunch backed, bent cigarette smoking incarnation of Anthony came searchingly to the window and then barrelling through the door. Poor fella was in the claws of the Chugoku’s frosty grip. We fuelled him up on vending machine cup noodles and hotdogs and tried to fire his spirit. A short time later he was speaking coherently and sitting up straight again. Tough as nails that one. Leaving him to thaw a little more, Collin, Oyvind and I set out for Mitou 160km away. Collin fuelled up the big blue meany and sailed out ahead of us. Oyvind and I were a few minutes behind. We caught up to him ½ hour later or so and trundled along together until…with a spec on the visor all my enthusiasm was frozen as if in suspended animation. Not rain now! Not here! The funnest and most challenging section was about to get slick. Damn it was already cold but not dangerous. The rain was gonna change that. Taking a note from another tourer’s book, there is no setback just another adventure! So, turned up the heat on the gloves, hunkered down a little behind the screen and cut a swathe thru the increasing downpour. Oyvind and I shuffled lead duties and without event, thankfully, we rolled into to Mitou. 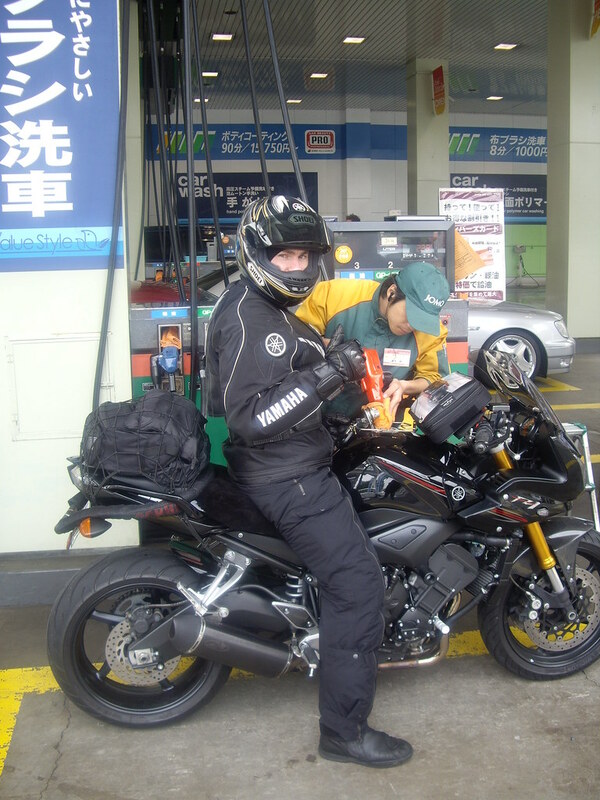 Our last fuel stop on Honshu and all down hill to the Shimonoseki straights from there. Couldn’t keep positive due to the cold, rain and lack of sleep. It was draining. So, fuelled up and soldiered on. That was a good move. Snaking down out of the hills the sky was showing the first tinge of dawn and the air was warming. 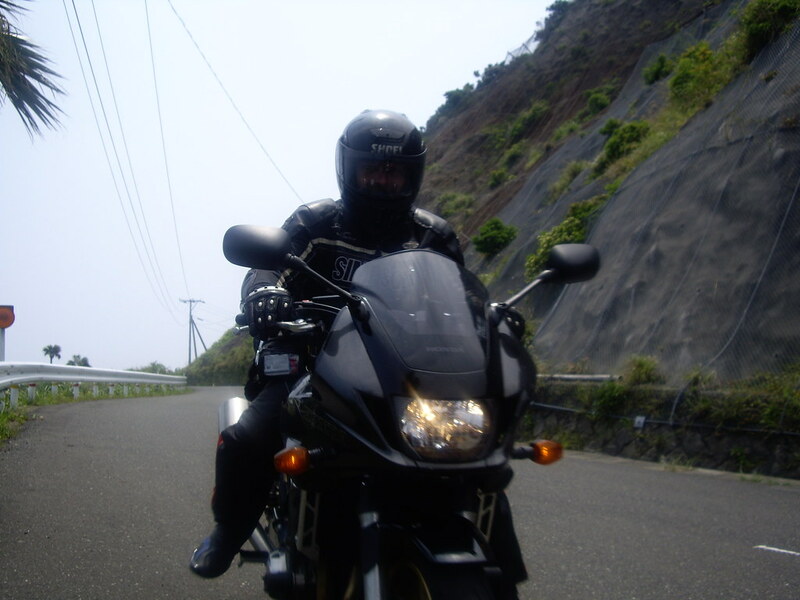 Crossing the big bridge to Kyushu again was like a welcome back and I was riding again. The air smelt and felt tropically warmer and the spirits were rising with the sun. But they do say the most dangerous hour is on the dawn. Oyvind said he noticed that I was leaving the cruise control on longer and riding like a robot as we pulled into Kitakumamoto after our longest leg yet, 225km. Economy riding just doesn’t do it for me. The FZ1 made a hiss when I opened the tank, a gasp of life or damnation for letting it run so low? I’ll never know but I suspect the later. We fuelled up then went to have a warm drink and give Anthony 5 or so minutes to catch up. Didn’t happen. Seems the cold had gotten the better of him and he’d crawled under his bike’s exhaust to keep warm and rest a bit before moving on. If only he’d gone another 100km or so he could have taken a kip in Kyushu’s relative warmth. Well, so goes the follies and fortunes of the ironbutt with his brother to thank for the wake up call that got him back on the road. The final leg was a change of scenery as it firstly comprised the usual 2 lane expressway run in the rising sun , before swing west on a one lane expressway where everyone was cruising well left , encouraging us to pass and stay on target. 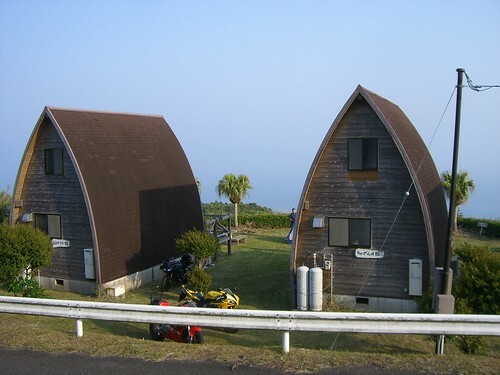 Rolling along this often elevated country byway gave great views from Kagoshima bay to the surrounding mountains and across the fields. It is a nice place to be in the morning light of a fine day. On exiting the expressway, Colin, Oyvind and myself had drifted back together again and as usual Colin didn’t need fuel so he headed south for the goal 100km away, meanwhile we pulled in to a one man Shell(I think) for the cheapest fuel of the trip. 125yennies/litre. Bargain! I’ll take a tank of that and so will my R1 riding friend here, thankyou. Checked the Mapple to defog the route and headed south. Previous calculations had put those last 100 country road kilometres at a 3 hour journey. We cruised along getting all the green lights and virtually no traffic, finding ourselves 15 minutes from the gaol with a 1/2 hour or so to spare when lo-and-behold there appears a convenience store sign in the distance. Breakfast? Yes please. Oyvind and I pit stopped and filled the belly. A wise move it seems as Colin had spent some time trolling around the end point figuring out how to get in, thus saving us some frustration. Thanks Naviman. Oyvind and I still had some problems, him less than me as it worked out. Damn that place was a labyrinth for the sleep dprived. Cresting the hill with 10 minutes or so to spare and seeing Egon(endwitness) with his Camera and Colin changed into casual clothes, I knew we’d done it. I could’ve ridden on in celebration but the road ended on top of that hill and beer was waiting on ice. Anthony, it seemed, had taken a wrong turn and missed the east bound expressway. But he’d improvised and finished up with some other riders on the west peninsula before ferrying it across the bay to meet up with us. Fantastic ride. In the weeks following we did some great touring. Cool bunch of riders with no stress to talk of. I’m tired but satisfied now. I got my fill.. . till next time. After finally finding my way into the Labarynth that was Satadeirando, touring legend Geezer, ciggy in one hand and camera in the other was there, waving me into the carpark to pull up by The Dude and Oyly’s bike. The Dude had already changed into his leisure attire and was standing by the R1 with Oyly. We had made it! But where was fastbike? Last time I’d seen him was back on Honshu and he’d sent a rather frantic email about oversleeping while clutching his muffler for warmth. 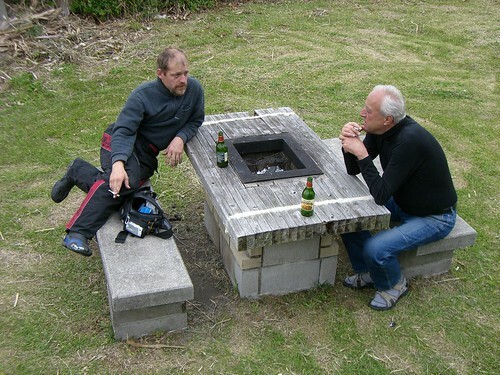 So a few minutes later I was heading out with 10 beers, rest to be delivered shortly, and the location of the bungalow. We fired up the bikes, loaded the beers into the Dude’s Givi and onto handlebars and made our way over to paradise. Sometime between Fastbikes call, Slowskippy and Karl’s call and the finishing of the 1st round of cigars, Egon went out for a tour of the local farmsteads and byways. Can’t keep a good tourer down! We continued munching, swilling and puffing away. Sun beating down, ocean breeze refreshing the spirit and more rambling bike talk the memory gets a bit fuzzy. Do remember the Dude semi comatose in the sun practicing his cat like reflexes catching beer bottle tops, Oyly looking like he’d never ridden the distance, saying it would have been better with a few fjords thrown in and first Fastbike then the Slowskippy-Karl train arriving. With the feasting done we trecked by keitai-light through the moonless darkness back to our escarpment perched abode. Karl and Slowskippy had set up tents in the surrounding lawn area and all loitered around the picnic bench/ balcony area. Then someone had the bright idea of getting the grill in the middle of the picnic bench going. Good place for a charcoal grill, bad place for a deforestation burnback. The campers were at the lawn fringes cutting and slashing all that would burn and loading it in to the tiny pit in the middle of picnic table’s little cavern. 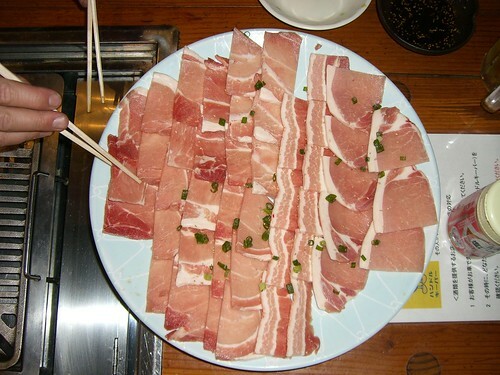 Many an eyebrow and arm hair were singed and more than a little skin pork-crackle grilled. Hahaha, folleys of the drunken. Quite entertaining to behold though. Yabanjins! Then the conversation turned decidedly sour with politics, religion and cultural superiority. I took my cue and retreated to the loft for a well deserved kip. The Dude and I had taken the 2 Futons in the loft and Geezer, Oyly and Fastbike had downstairs to themselves. The Yabanjins gasbagged on into the night, bellowing roars of laughter and disbelief over the local night sounds. I drifted off to the land of white lines, good times and cerebral fluid churning motion recollection. Until the next day! Photos courtesy of the Dude. May 12, 2008 in Ironbutt, Looong Ride Reports.